PSNews - General To Lam, Politburo Member, Secretary of the Central Party Committee of Public Security, and Minister of Public Security on March 4th read a lecture at the 74th training course on national defense and security organized at the National Defense Security. PSNews - On the occasion of the 60th Anniversary of Vietnam’s Border Guard (March 3, 1959 – 2019), Lieutenant General Nguyen Van Son, Member of the Public Security Central Party Committee, Deputy Minister of Public Security, visited and worked with the Border Guard Post of the Tra Linh Border Gate, Cao Bang on March 3. PSNews – Lieutenant General Nguyen Van Son, Deputy Minister of Public Security, on March 4 visited and worked with the Cao Bang Provincial Police. PSNews – Senior Lieutenant General Le Quy Vuong, member of the Party Central Committee, Deputy Minister of Public Security on March 1st answered some questions from journalists about the security work during the 2nd US-DPRK summit in Hanoi on the sidelines of the regular monthly government’s meeting. PSNews – The member units of Emulation Grouping 6 under the Ministry of Public Security (MPS) on February 28 held a ceremony in Hanoi to sign a mutual emulation agreement and launch the emulation movement “For National Security” in 2019. PSNews – Traffic policewomen of the Hanoi Municipal Police Department always try their best to ensure traffic safety on the road in spite of any weather conditions. PSNews - On the occasion of the 64th anniversary of the Vietnamese Doctors’ Day, representatives of the Public Security Newspaper on February 26 visited and congratulated doctors, nurses and workers of various hospitals in Hanoi. PSNews - Deputy Ministers of Public Security, Senior Lieutenant General Bui Van Nam and Lieutenant General Nguyen Van Son, visited and checked the security works at various places in Hanoi, the host city of the 2nd Summit between the Democratic People’s Republic of Korea (DPRK) and the U.S.
PSNews – During his visit to Myanmar, General To Lam, Politburo member and Minister of Public Security leading a high-level delegation of the Ministry of Public Security (MPS) of Vietnam visited the Embassy of Vietnam in Yangon on February 26. PSNews - The Emulation Grouping 5 under the Ministry of Public Security (MPS) on February 22 organized a ceremony in Thua Thien - Hue to sign the mutual emulation agreement in 2019. PSNews - The Public Security Theater on Wednesday held a ceremony to receive a number of musical instruments presented by the Pho Hien Entrepreneurs’ Club. General To Lam, Politburo' member, Minister of Public Security attended the event. PSNews - The Standing Board of the Public Security Central Party Committee in February held a conference in Hanoi to review its self-criticism and criticism work in 2018. General To Lam, Politburo member, Secretary of the Public Security Central Party Committee and Minister of Public Security chaired the event. PSNews - The Ministry of Public Security (MPS) on February 21 held a meeting with leaders of the Ministry of Health, professors and doctors in the health sector, and leaders of hospitals in Hanoi on the occasion of the 64th Anniversary of the Vietnamese Doctors' Day (February 27). 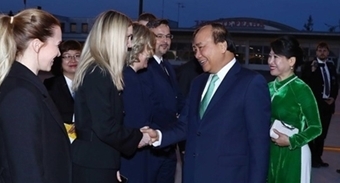 PSNews - Senior Lieutenant General Nguyen Van Thanh, Deputy Minister of Public Security recently hosted a courtesy reception for Mr. Shaul Mofaz, former Deputy Prime Minister and former Minister of Defense, former Chief of General Staff of the Defense Forces of Israel. PSNews –Minister of Public Security General To Lam held talks with his Lao counterpart, Senior Lieutenant General Vilay Lakhamfong, Secretariat of the Central Committee of the Lao People's Revolutionary Party and Security Minister, following a welcome ceremony for the latter in Hanoi on February 20. After the talks held earlier on February 20, Minister To Lam and his Lao counterpart, Minister Vilay Lakhamphong co-chaired a ceremony handing over Orders from the Lao State and Certificates of Merit from the Minister of Security of Laos to the units and individuals of the MPS of Vietnam. The Animal Training Center under the Mobile Police Command, the Vietnamese Ministry of Public Security (MPS), in February, held the Closing Ceremony of a Veterinary Medicine Course for five officers of the Cambodian Ministry of Interior. PSNews - Youths of the Quang Tri Provincial Police Department visited various rural areas to give support to local people in the first days of the Lunar Year 2019. PSNews - In recent time, the Hoi An Municipal Police has promoted the movement "All people protecting national security", while actively preventing and handling crimes, particularly property theft and robbery. PSNews - The Tam Chuc Pagoda Festival officially opened on February 16, in Ba Sao, Kim Bang, Ha Nam. With the aim of ensuring security for this festival, the Ha Nam Provincial Police Department in collaboration with other functional units deployed security plans.